JConcepts now offers a suspension conversion set for the popular Slash 4x4 and Stampede 4x4. The upgrade includes carbon fiber front and rear shock tower, aluminum shock stand-offs, body mount adaptors and aluminum caster blocks. Using this combination of parts along with other parts (not included) help build the ultimate monster truck from two of either of the most popular Traxxas vehicles on the market. The 4mm long-stroke front shock tower has been designed to use a longer Traxxas shock (not included) for better shock geometry in rugged conditions. The carbon material improves response of the suspension and provides a stable setting for the included aluminum body mount adaptor. The rear tower, also in 4mm material, utilizes the stock geometry but with the addition of carbon fiber and precise machining, tightens up the feel of the rear suspension. The included aluminum shock stand-offs position the shocks at an advantageous angle and allows the shocks to work as designed. All the changes to the geometry conclude with the new caster blocks. The camber link position has been revised and extra material trimmed to allow smaller diameter wheels needed for monster truck wheels and tires. The machined aluminum blocks are durable and are finished in a high-gloss black anodizing. The set includes heavy-duty 3mm hardware to secure the transformation. 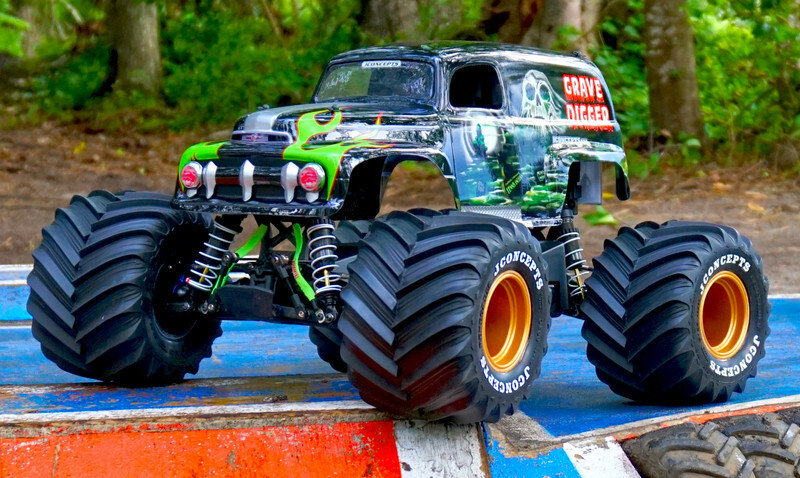 This set of parts, combined with the list of items below complete a conversion to the ultimate monster truck for racing, bashing and free-styling. Shipping Charges: Our standard shipping charge is $6.50 for the 1st item and $2 for each additional item purchased. This product was added to our catalog on 06/10/2015.